Earlier essays in this series noted the fact that science fiction poetry operates at the intersection of several different traditions (science fiction, science and fiction, poetry), each of which is itself fraught and conflicted. However, one thing that makes an award useful is that it canonizes certain works and writers and, in the process, raises their work up for closer examination. 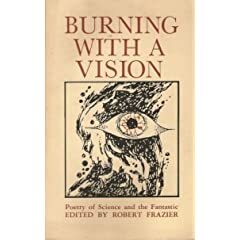 One thing this examination begins to show in 1980 is a few independent patterns among the Rhysling winners; one might then reflect outward into science fiction poetry in general and see if these patterns dominate there as well, becoming both poetic patterns and thematic traditions. One of two poems that won in the short poem category that year, Peter Payack's "The Migration of Darkness," shares approaches with Duane Ackerson's "Fatalities," which had won in the same category the previous year. Like "Fatalities," "The Migration of Darkness" is a single extended metaphor, and both poems are immediately accessible. They are poems that are science fictional in their themes and ideas, but which "lower the bar" for reader entry. This is not meant as a dismissal; it takes both skill and heart to create a poem as genuinely charming as "The Migration of Darkness." In it Payack provides a single "What if" idea: what if darkness were not simply the absence of light, but a thing in itself? Darkness has often been given spiritual qualities or charged with emotions; it is the site of much disturbance. Payack taps this frequent association by giving darkness physical qualities; it is not a gap or an absence, but "is composed / of an almost infinite number of particles." This image is at once useful, startling, and informed. It matches the sense of night and shadow creeping, almost spilling in around corners, that comes with sad and scary evenings, and it also presents dark as the mirror image of light, which has been described as both wave and particle. Once presented, the image seems so logical that it poses its own rhetorical question: why can't there be particles of darkness? From there, it is but a small step to dividing and classifying these particles; one can almost imagine David Langford's wonderful story "Different Kinds of Darkness" springing from the poem. But Payack does not stop there; he also gives darkness biological qualities. He posits darkness flies south "to a more fertile land in a never-ending search / for an abundant food supply" and describes its movement across the land as a "migration." Images of these particles swarming, gathering, and "seeking shelter from the strong sunlight" abound. In a series of simple lines, often lightly indented as if delivering asides or marking a learned speaker's cadence, Payack evokes a naturalist's approach to the actions of an entire new species. He does not stop there, however. By closing with a discussion of shadows as members of this species that "have a somewhat shorter lifespan / than those who migrate" Payack manages a startling reversal: in less than a page readers are brought first to wonder at, and then to pity, a heretofore unnoticed passing of a natural object. Here too Payack's poem functions like "Fatalities," in which minutes were killed. The second of the winning short poems from 1980, Robert Frazier's "Encased in the Amber of Eternity," also presents several data points to solidify patterns begun in previous years. The first pattern Frazier clarifies is the importance of time in science fiction poetry. This should come as no surprise, given the emphasis on the fleeting nature of life in mainstream lyric poetry and science fiction's emphasis on the future. What's interesting is how dominant this theme is in the poems that have won and the particular spin these poems have given this theme. While there are chronological sequences in most of the Rhysling winners, such as a countdown in Gene Wolfe's "The Computer Iterates the Greater Trumps," several of the poems explicitly focus on time. Duane Ackerson's "Fatalities" embodies time in order to kill it, and Ackerson's "The Starman" meditates on the ache of time dilation and aging, fused together, that take the starman out of his world. Steve Eng's "Storybooks and Treasure Maps" focuses on a more personal time: the defense of innocent wonder against the onslaughts of mature forgetfulness. Andrew Joron's "Asleep in the Arms of Mother Night" skips across eons to a time when mythic beings awake and thereby change ages of the world, and Michael Bishop's "For the Lady of a Physicist" rings changes on Marvell's time-pressured courting in order to create a love beyond entropy. Adding to these myriad approaches to time, Robert Frazier's "Encased in the Amber of Eternity" provides a vision of Earth after some never fully specified event, when everything has changed, yet nothing has changed. Precisely how much after this poem follows isn't clear. Frazier's indication that the narrator watches "the Torchships fall like comets," letting us know both that Frazier is steeped in SF (the term "torch ship" has been appearing in science fiction since at least the 1950s) and that enough time has passed that one of two things has happened: either humans have developed torch ship technology, or the aliens have come. No matter which way the torchships have come, there is war, sketched in beautiful, apocalyptic images. The torchships are "dancing a St. Vitus dance" (St. Vitus dance is a term for a neuromuscular condition involving involuntary spasms) and look like "fireflies hovering over the pyre of Portland." This alliterative line is a wonderful multiple impossibility: fireflies tend to dart, not hover; nothing hovering should be twitching and flailing like a sufferer of St. Vitus dance; and if this is happening over a Portland that is already a pyre, the world has changed and both ship and metaphor (the fireflies) are about to die. A string of images follow, documenting just how much has changed, is gone, is lost, "Yet here in my mountain retreat only time has changed, / crystallized into honey." This line is a beautiful objectification of human loss, and a self-reflective one: all that is trapped in amber is dead. Amber itself is crystallized tree resin; it shows that living things bled and died, long, long ago. However, time has changed that ancient pain into a precious stone, just as the passing seasons will turn the fall of human civilization into a lost beauty, for there in the mountains, nothing has changed but time. Payack's "The Migration of Darkness" would be accessible to any non-SF reader willing to follow the metaphor. Frazier's "Encased in the Amber of Eternity" demands readers take a few steps further and that they come armed with a few more genre- or science-specific bits of knowledge: they must know torchships, and they are better equipped to understand the poem if they know the mechanisms of amber and St. Vitus. However, neither of these poems presents anywhere near the challenge of Andrew Joron's "The Sonic Flowerfall of Primes." Unlike Joron's "Asleep in the Arms of Mother Night," a title which could be taken for anything from a children's book to a folk song, "The Sonic Flowerfall of Primes" presents an immediate alienation, and sets the bar high for both pleasure and understanding. Joron's artful and pleasing alienation begins with the title, which presents questions and paradoxes to the reader. If it is a flower that's falling, how is it "sonic"? Is that a sound of the nearly silent fall of petals? If so, what are these "primes"? Are they the best, the only, or simply the mathematical concept of prime numbers? Though the longest poem to win the Rhysling up to this point, "The Sonic Flowerfall of Primes" is very much a lyric. That is to say, Joron's poetic answer to the questions posed by his title is the story of a song. It begins with the entry of the never-fully-identified host-narrators, who enter the stage at "A red dusk" only to be followed immediately by the "agape's guests / Surely to ascend again / Their angry forum—O golden solons / From a metal-poor Utopia." The scene is set, but complexities and questions have only multiplied. A reader who shares Joron's background in philosophy will recognize agape as a term referring to a specific form of love, a love that is spiritual and emotional, rather than sexual and that is closer to chosen compassion than simple spontaneous affection. However, agape also has more active and political connotations; there are Agape organizations and foundations that are devoted to creating a society that is more just. (One of these is centered in California, where Joron lives.) This would fit with both the idea of a utopia and calling the people "solons," after the great lawgiver of classical Greece. By a curious serendipity, since that time, another fitting meaning of "agape" has arisen; AGAPE also stands for Amateur Group for Astronomy Projects at ESO. Though founded long after Joron's poem was published, this too fits the image of a meeting of beings "From a metal-poor Utopia." One final doubled meaning from these lines, to match the title: these "solons" are essentially meeting in a futuristic "salon," where, one assumes, they will discuss matters of great philosophical weight. And they do, in a surprising way. The next few stanzas further set the scene; we watch as the narrators "raise up columns of soft light" and otherwise prepare for the entrance of "the player on his oud" (a stringed instrument similar to the lute). In other words, what will follow is a song, performed for these solons. The matter upon which they meditate is not some abstract principle, but rather love. Half a dozen stanzas follow that evoke a meeting of lovers. The subject is an ancient one in human history, and indeed, in poetry, but Joron renders it new and poignant by approaching it science fictionally. To speak of a woman who is "Never to know him except as herself" could be an evocation of soul mates, and to say that "each felt the other's suffering" describes the depths of empathy experienced by many lovers. At the same time, however, Joron indicates that this love is something new. The songs sung are "devoted to his female double / Whom we'd developed as the back-up unit." These are lovers who love because they were designed from the same template—most likely electro-mechanical, perhaps biological—who resonate because they are, in the deepest sense, one being. Here Joron evokes the power of Plato's description of lovers being essentially two halves of one being. From the couple, the listeners' attention moves outward to the world, a world of poetic images but uncertain status. Does "the dead audience" include the listeners narrating the poem too? Is the "Binary citizenries, one-and zero-numbered" an indication that the people listening are no more than electronic records? Are readers watching ghosts watching ghosts? Or are these older binaries (male and female, like the singer, or simply sleeping and waking, living and dead) who are recorded or numbered for their "safety," as has happened in more than one literary "utopia"? The poem closes with two stanzas that close the song, the day, and the dream; readers are told that "Today's dreaming of the landscape is done." We find that the narrators are looking down on a place "Where we were sovereign" and at a landscape marked by "the rubble left behind / By these technological glaciers." These lines indicate an elevated perspective, but again, one with multiple possible interpretations. Is this a fallen civilization, with only the dead and the remnants below? Is this a fallen civilization, with only ghosts, electronic or spiritual, left to meditate upon the remains? Or is this a time and place beyond sovereignty, and beyond mechanical technologies? These and many other questions remain when the poem ends. Indeed, this discussion of "The Sonic Flowerfall of Primes" leaves many questions unanswered and many depths unplumbed, precisely because, once a reader enters the poem, the experience becomes key, not the meaning. Just as time seems to halt when one is in love, when one listens to a song that seems to sum up one's emotions, or when one contemplates the Absolute that Joron evokes repeatedly throughout the poem, so it halts here, in an evocative scientific romance that passes beyond immediate explanation. In this poem Joron has taken the most challenging approach to science fiction—presenting a fully realized and internally consistent Otherworld without explaining it. What's more, in this poem Joron has wedded this ambition to one that is an ambitious approach more specific to poetry, presenting image after connected image, many of them clustering around themes that are themselves related. In this case, the images of transience (candle smoke, flowers, dreams, cloud shapes) and permanence (flies in electra, the Absolute) dance around those of love, and images of representation (icons, calligraphy, hymns, songs, programming) dance around evocations of persons, personae, and roles that seem timeless. Joron evokes the Absolute, the gods, the ancient images of a bard singing for the mighty, and of course, a love that surpasses both the physical and the end of all that produced it, such as bodies and civilizations. To wed such ambitions, as Joron did in "The Sonic Flowerfall of Primes," is impressive indeed.